Now that you’ve decided to jump into the home buying process, it’s time to face the alphabet soup of mortgage loans. From the outside, it looks like a jumble of meaningless letters, acronyms, and silly names like FHA, VA, Fannie Mae, and Freddie Mac. What do they all mean and how do you know which one is right for you? 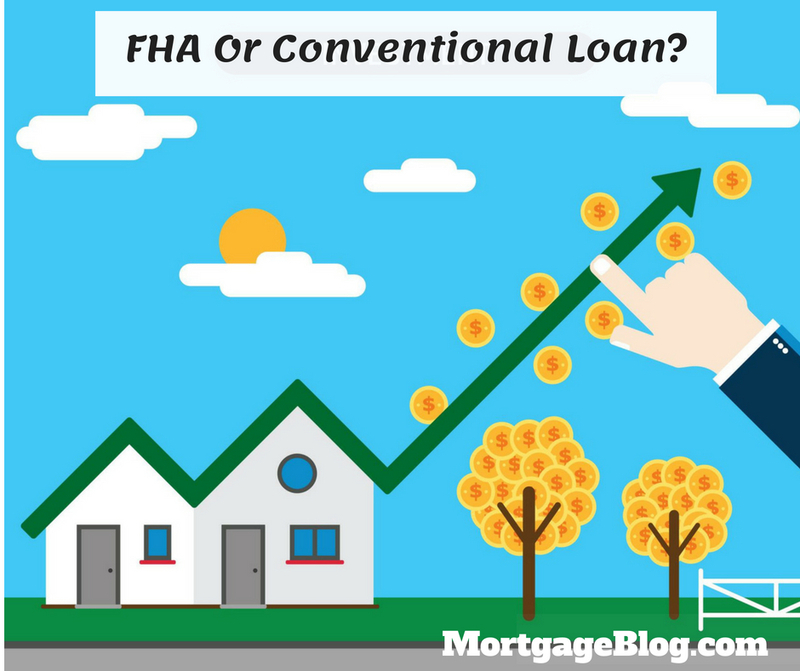 In this blog post, I’m going to help you learn some primary differences between an FHA loan and conventional loans, which includes Fannie, Freddie, and Jumbo loans. Be prepared – many of the historical differences between these types of loans have disappeared in recent years. The remaining differences have to do with mortgage insurance and a few underwriting guidelines. The Federal Housing Authority (FHA) is a government agency created in 1934 to help more Americans own homes. Specifically, it provides mortgage insurance to the lender making the loan in case the borrower defaults (fails to pay) on the mortgage. The insurance premium is due no matter what size of a down payment the borrower makes. FHA loans require a portion of the premium upfront (or at the time the mortgage is made) and monthly for the life of the loan (in most cases), and stays in place no matter how much equity accumulates in the property. Conventional loans require mortgage insurance for the same purpose as an FHA mortgage (to protect the lender in case of a default on the mortgage), but only for loans with less than 20% down payment. The insurance is provided by private companies, which is where the term PMI comes from (private mortgage insurance.) PMI on a conventional loan only carries a monthly premium and no ‘upfront’ portion is due, and it can be removed based on the equity in the property. Through a combination of paying down the mortgage and property appreciation, borrowers can contact the lender when they have at least 22% equity and request the insurance cancelation. Compared side by side, mortgage insurance on an FHA loan will cost more both in premiums and in mortgage interest. The portion of the insurance premium that is due upfront on an FHA loan is typically added to the original loan balance, and the monthly payment is made on the total amount. While FHA interest rates generally are lower than rates for conventional loans (with less than 20% down payment), the payment on the FHA loan is likely to be higher for the same property. FHA used to stand out as the best option for buyers with less cash available for a down payment because it allowed a down payment of a minimum of 3.5% of the purchase price. Now, however, Fannie Mae and Freddie Mac have programs that will enable borrowers to make a down payment as low as 3% of the purchase price. Both types of loans allow the borrower to pay for the monthly mortgage insurance by increasing their interest rate above the lowest prevailing rate. For conventional loans, this is called ‘lender paid mortgage insurance.’ Typically, a slight increase in the rate of one eighth to a quarter percent eliminates the need to pay a separate MI premium monthly. Since mortgage insurance premiums are tax deductible at lower income levels, some borrowers may find that paying a higher interest rate (mortgage interest to deduct) is preferable to a lower rate and the MI payment. Talk to your tax advisor to find out if this might be a beneficial option for you. While all mortgages require a property appraisal, FHA appraisals were traditionally more detailed as the appraiser was required to note any “health and safety issues” they saw while inspecting the property. After 2010, however, the requirements for all appraisals have been unified. If the property condition poses a health or safety issue, as noted by the appraiser, an FHA loan will require correction or repair before the loan closing. Conventional loans need the same; however, there may be a small amount of flexibility. It’s hard to imagine choosing an FHA loan after reading all of this, but it may be the best option for some borrowers. In general, the underwriting guidelines for an FHA loan are more lenient than those for conventional loans. Specifically, FHA may allow a higher debt-to-income ratio than a conventional loan. Credit guidelines are also more flexible both with past delinquencies and more serious derogatory credit events, as well as the depth of a borrowers credit history. With property values increasing across the country, along with interest rates, waiting for a credit score to improve or a delinquent record to drop off your report may not be attractive. FHA loans will allow some borrowers to buy a home sooner than they may otherwise have been able to with conventional financing options. If interest rates drop in the future, you can refinance using the FHA streamline, which reduces the usual process and won’t require a new appraisal. Conventional loans can only be refinanced by starting over at square one and going through the full loan qualifying and process again. The more you know going into the home buying process, the better questions you can ask and the better decisions you can make. But nothing replaces the benefit of working with an experienced lender to fully evaluate your situation and give you the options that will work best for you. There’s so much more to it than the interest rate.